Many Sky Lights readers own telescopes or binoculars. Once you’ve learned your way around the sky and know where to point them, those instruments are essential for learning astronomy. So here’s a post about elementary optics, just to help you understand what telescopes and binoculars can actually do. Magnify objects that are otherwise too small to be seen. Brighten (amplify) objects that are otherwise to dim to be seen. Some optical systems are designed to do both, but with a compromise in image quality or brightness. Sure … if you’ve got $2.5 billion USD, you can build the Hubble Space Telescope and get both. But for us amateurs, there is no such thing as a “perfect” system. Your choice of instruments depends on which celestial objects you want to observe. Let’s first talk about the difference between microscopes (or common magnifying glasses) and telescopes (or binoculars). Things like bacteria or pollen spores look small because they are small. Things like distant moons and planets look small because they are very far away. Yet moons and planets are intrinsically large objects. Seeing these small or distant objects requires different combinations of lenses and/or mirrors (optics) to bring them into clear view. You can’t use a microscope to look at the Moon, and you can’t use a telescope to look at a germ. The science of optics provides a way to see both, albeit with different instrument designs. The image above is through a telescope optimized for magnification: my Takahashi FS-128 refractor. 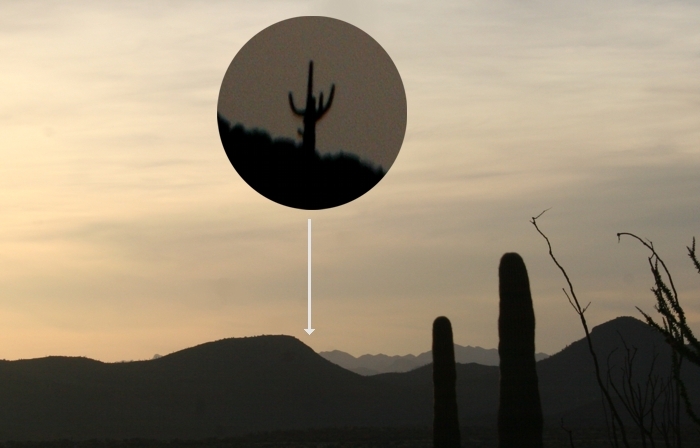 The saguaro cactus [inset] is about 5 km (3 miles) from my home. The magnification is around 300X. You are seeing that cactus 300 times larger than you would with the unaided eye, as if you were only 16 meters (0.01 miles) away. Other telescopes are designed to amplify faint objects that don’t need magnification. The classic example is M31, the Andromeda Galaxy, our nearest neighbor galaxy in space. 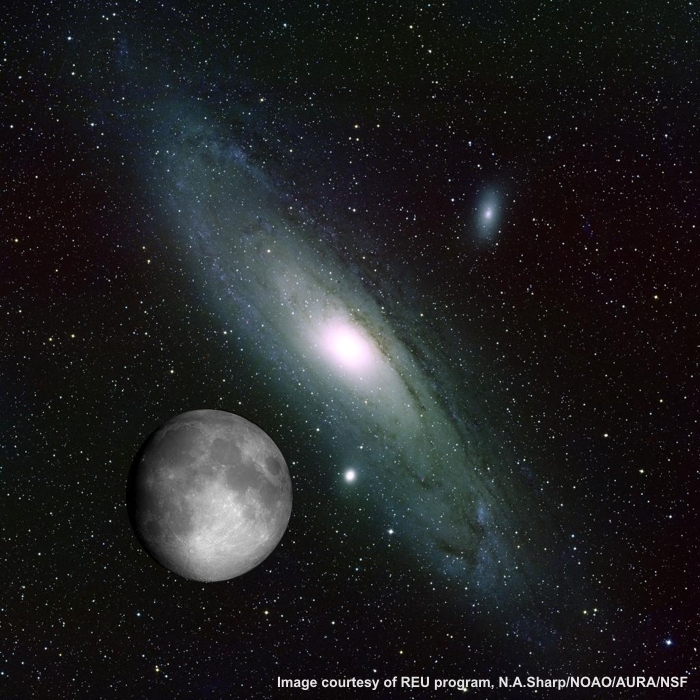 The image below shows M31 superimposed with the nearly-Full Moon. You can see M31 with the unaided eye, but you only see the bright central core. If your eyes could see the fainter light of its spiral arms, M31 would appear 6 times larger than the Moon. The science of optics has been around since the early 1600s, when the first microscopes and telescopes were invented. Since that time, the quality of the glass used for lenses and mirrors has improved astronomically (no pun intended). Instruments used by amateurs these days would amaze those early experimenters.